Just who is the best of the current world heavyweight champions? Is it WBA/IBF/WBO ruler Anthony Joshua, 22-0? Is it WBC king Deontay Wilder, 40-0-1? Or is it lineal champ Tyson Fury, 27-0-1? Unfortunately, unless something big happens at the negotiating table (or tables) later on this year, chances are we will not get a definitive answer here in 2019. Here’s how things stand right now: Joshua will fight unbeaten challenger Jarrell Miller in his U.S debut on June 1, and there is a rematch clause in place. Wilder will fight TBA on May 18, very possibly his mandatory Dominic Breazeale getting the shot. Fury will fight in either May or June, against TBA – with names such as Joseph Parker, Oscar Rivas and even Manuel Charr being mentioned as possible opponents. With the Wilder/Fury rematch being put on ice and with no deal anywhere close to being reached between either Wilder and Joshua or Fury and Joshua, all three men will likely carry on fighting on their separate roads, on different TV networks, for the remainder of the year. But will all three men still have their unbeaten records come the end of this year? Is it not likely, at least in terms of a law of averages, that one of the three loses this year? It’s possible, and if it happens, what then? Right now, many people are mad and disappointed that the Wilder/Fury return is not happening next, as it should be, the fight currently red-hot. 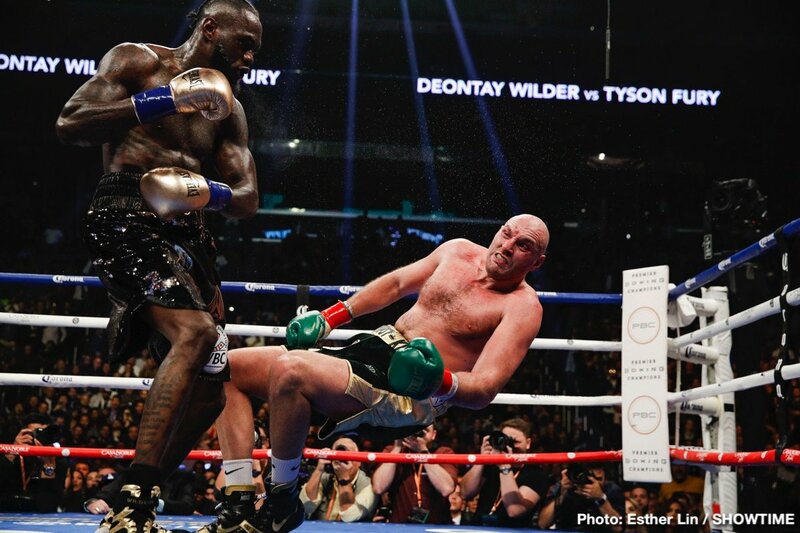 If one guy does lose this summer, or in their fight after that, bang goes Fury/Wilder II, at least in terms of it being a super-fight with serious mystique attached. Part of the appeal is the fact that both men are unbeaten, that they have never lost. Yes, a rematch would still sell if either Fury or Wilder lost their “0” before hooking up again, but no way would it be as big. And who knows, maybe a fiercely determined Breazeale fights the fight of his career and scores the upset in May. And might Fury take his eye of the ball when going into his first highly-paying fight for ESPN? Again, one of these guys could lose. And as for AJ, Miller is coming across as very convincing when he says he will defeat him on his home turf in June. If all three reigning champions can retain their belts and their unbeaten records this year, the clamour for them facing one another will only be bigger. But until those massive, massive fights are signed, sealed and delivered, all three men are taking a chance in losing out by taking other fights in the meantime and getting upset. Maybe deep down, one, two, maybe even all three champions are quite content taking so-called “easy” and “safe” fights and earning well whilst doing so. But the fans sure are not happy. Which of these three individually talented fighters will take a risk by stepping up to the plate first? Wilder and Fury did it once, surely they can do so again? You are here: Home / Boxing News / Wilder, Fury, Joshua: Will All Three Rival Heavyweight Champions Remain Unbeaten This Year?